Abortion opponents in the Texas state legislature have been busy this week trying to pass a bill aimed at banning most abortions after 20 weeks of pregnancy. The proposal, which passed the House on Monday, is now facing a Democratic filibuster in the state Senate. If the Senate approves it before the end of the legislative session at midnight and Republican Gov. Rick Perry (as promised) signs it, Texas would become the 13th state in recent years to enact such a restriction. At first glance, the trend toward more state-level limits on abortion access seems out of line with the balance of national public opinion. Pew Research Center data from 2012 surveys show that 54% of American adults want abortion to be legal in all or most cases, while 39% want abortion to be illegal in all or most cases. Also, a 2013 Pew Research survey of Americans’ views on Roe v. Wade, the landmark 1973 Supreme Court ruling guaranteeing a constitutional right to abortion in at least the first three months of pregnancy and in some cases later, found that nearly two-thirds of Americans (63%) do not want Roe to be overturned, while just 29% want the decision completely overturned. On closer inspection, the situation is more complex. It is true that the populations in most of the states that recently have enacted abortion restrictions tend to be more conservative on the issue. But it’s worth noting that some efforts to expand or protect access to abortion in states known to be more liberal on the issue have recently failed. Last week in New York, Democratic Gov. Andrew Cuomo’s proposal to protect late-term abortion rights was shelved after it did not make it through the state Senate, which is controlled by a coalition of Republicans and a few Democrats. A careful look at aggregated data from Pew Research polling in 2011 and 2012 reveals the nuanced nature of opinion on the issue and the large amount of gray area. 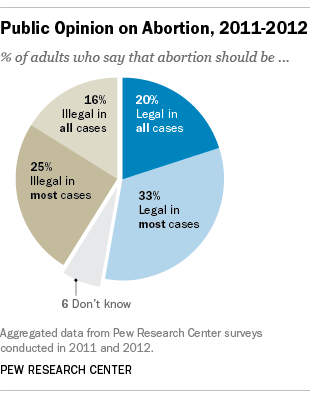 While a majority of Americans say they support some abortion rights, more of those say abortion should be legal in “most” cases (33%) rather than “all” (20%). On the other side of the debate, 25% say abortion should be illegal in “most” cases and 16% say it should be illegal in “all” instances. In other words, majorities of both supporters and opponents of abortion rights approve of some exceptions. Courts have long grappled with the complex questions surrounding abortion, and the constitutionality of some of the new anti-abortion laws remains in doubt. A recent North Dakota law banning abortion in most cases when a fetal heartbeat is detected, which may occur as early as six weeks into a pregnancy, and an Arkansas measure that would outlaw most abortions at or beyond 12 weeks are among the laws facing court challenges.